The HRR Colour Vision Test diagnoses congenital and acquired colour deﬁciencies using simple shapes. It comprises a 6 plate screening section plus 14 detailed diagnostic plates to determine the type and extent of colour deficiency. The first four plates are used to show the patient how the test works. The next six plates (screening series) present the most difficult yellow, blue, red, and green colours. Success with these plates defines the subject as having ‘normal colour vision’ and completes the test for that person. 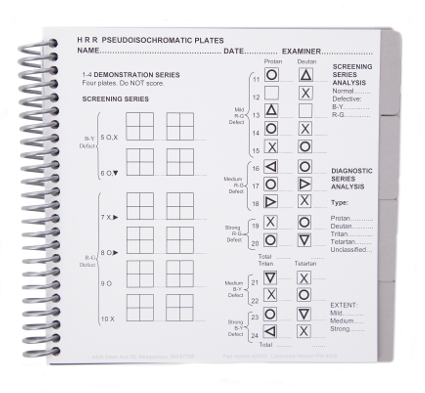 The subsequent 14 plates (diagnostic series) cover all four colours and provides diagnostic as to the extent (mild, medium or strong) and type of defect (Protan, Deutan, Tritan). The HRR 4 Edition has been proven effective in more than six different clinical trials to date. The test comes with an encapsulated matching card. You can purchase a separate matching card here. The HRR test uses simple figures which can be located in any quadrant on each plate. 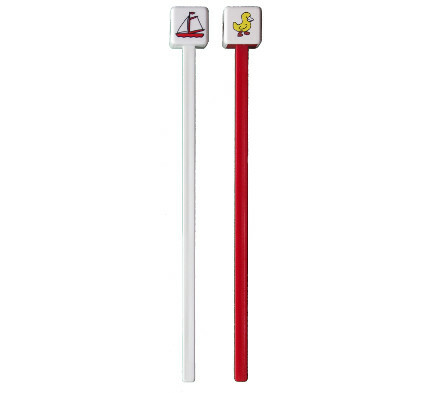 This combination is virtually impossible to memorise, unlike Ishihara-type numbers based tests and is suitable for testing pre-school children. Plates are numbered for scoring on the reverse and each page is tabbed for easy selection and to help keep the pages clean. The paediatric version has laminated pages (colours verified with a Spectrometer) to avoid damage from little fingers and protect the pages for years of use. Also included is a set of matching cards, instructions, and reproducable score sheet. A version with 4 Amsler grids is also available. Price and information on request. Cole B L, Lian K, Lakkis C, 2006, The new Richmond HRR pseudoisochromatic test for colour vision is better than the Ishihara test, Clinical and Experimental Optometry, 89(2), pp 73-80. Full-text available online. Bailey J E, Neitz M, Tait D M, Neitz J, 2004, Evaluation of an updated HRR color vision test, Visual Neuroscience, 21(3), pp 431–436. Abstract avilable online.